A swing film that doesn't focus on the dancers. 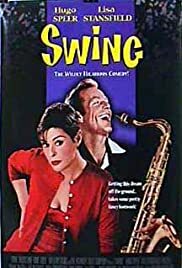 I had the opportunity of seeing a screening of "Swing" at Culver Studios, Los Angeles in August 1999 and was more than pleasantly surprised at the performance of Lisa Stansfield. She's a natural actress with incredible screen comfort and grace. The ensemble was incredible and thoroughly believable. Clarence Clemmons was a very nice added touch as the "voice of reality." I was particularly intrigued with the fact that this film dealt with the hero's (Hugo Speer of "The Full Monty") desire to form an orchestra and not on a bunch of Gap Commercial dancing tazmanian devils. This film never goes in the direction you expect it to. The hero's problems are rarely through any fault of his own nor is he portrayed as a bumbling "ex con who just can't make the right choices." His character is believable, likeable and you will find yourself rooting for him. Ms. Stansfield held more than her own in this film and gave some unique, sensual and breathy renditions of "Watch The Birdie" (originally performed by Miss Anita O'Day) and "Ain't Nobody Here But Us Chickens. Other outstanding characters are Peter Usher as Liam and Rita Tushingham as Mags. This is definitely a feel good movie and a guaranteed TOE TAPPER. Several people commented at the screening that they were very tempted to get up and dance in the aisle.